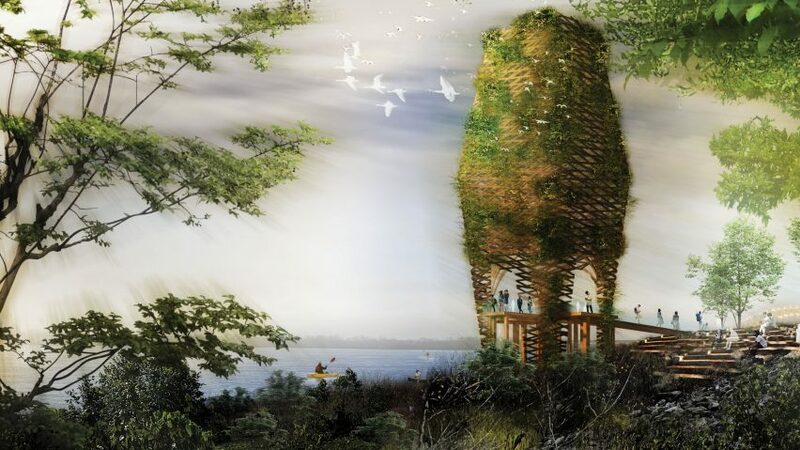 US architecture firm Studio Gang has revealed plans to overhaul a park on Memphis' Mississippi River, which include building a plant-covered viewing tower, bulbous stoney structures, and a gridded canopy for basketball. Studio Gang has designed the transformation of the 30-acre (12.1-hectare) waterfront Tom Lee Park in collaboration with landscape architecture studio SCAPE. The aim is to provide a better connection between the river and the city, restore natural ecology, and add a number of public facilities. These will include areas for education, sports, recreation, play and events, alongside amenities like a cafe, lockers, storage and bathrooms. "The new Tom Lee Park will be a civic space for everyone in Memphis to enjoy," said Studio Gang founder Jeanne Gang in a statement. The scheme will segment the park, which stretches from the top of the bluff to the bank of the Mississippi, into four distinct zones. Each will draw on features of the Mississippi River Basin, and be named The Gateway, The Riffle, The Pool and The Tailout. "The dynamic forms of the Mississippi River Basin itself inspired a series of rooms in the park, creating a unique template for diverse civic spaces and ecological revitalisation," said SCAPE's design director Kate Orff. New structures, meanwhile, will take cues from historic designs previously built on the Memphis riverfront, like terminal buildings, grain elevators and barges to suit the surroundings, according to Studio Gang. "We've designed the architecture to float in the landscape like vessels on the river, creating a park that uniquely reflects the changing nature of the Mississippi River and the city along its banks," said Gang. The walkway will join the city's Beale Street to the Beale Street Landing on the water's edge. Here, visitors will be greeted by the Oxbow plaza, where water features and native plants will be interspersed with open space for public events, installations and festivals. The Riffle will form the heart of the park, and is modelled on the "pattern of river water flowing over stones" – renderings show bulbous forms wrapped by pathways. At the centre, a large gridded canopy will cover sports courts designed for basketball, yoga, dance, and fitness classes. Other features include "eco edges" along the water. Looped pathways will thread throughout the park to connect the different areas, and include a one-mile running circuit and workout equipment. Next up, The Pool zone will be made up of a series of lawns and ponds for open-air sports games, and activities like picnics and kite flying. Large events, such as the city's annual Beale Street Music Festival, will also be hosted here. The team's intentions for the southern end of the park, known as The Tailout, are to leave it wild and provide facilities for outdoor learning. An outdoor classroom design for STEM (science, technology, engineering, and mathematics) programmes will be included. An architectural landmark will be placed at the bottom of the park, known as the Habitat Tower. Accessed by a bridge, the latticed structure will offer views of the water during the day and the Mighty Lights show on the river at night. Planting will adorn the tower to encourage birds to nest, as part of a wider ambition to include local flora and fauna for ecological restoration. Other greenery will be added throughout the park to bolster shade provided by the tree canopy. Additional environmental features included in the scheme are systems to mitigate water pollution, photovoltaic panels for energy, and stormwater collection. In order to engage the local community in the transformation of Tom Lee Park, the team engaged with local students from North and South Memphis. "Our design builds upon two years of work alongside Memphians, which began with the Riverfront Concept, our proposal for the Riverfront as a whole, and is inspired by the extraordinary work that today's Memphians are doing for their community," said Gang. The Memphis River Parks Partnership behind the project is also inviting Memphians to view the redesign in the Tom Lee Park Engagement Center at Beale Street Landing. The exhibit features an architectural model, renderings, animations and a virtual reality walkthrough of the scheme, alongside information about the park's namesake, African-American river worker Tom Lee. "After hearing from more than 4,000 residents and visitors, and learning from more than 100 years of riverfront planning, we're thrilled to share a design direction that Memphians can call theirs," said partnership CEO and president Carol Coletta. Slated for completion in 2020, the Tom Lee Park redevelopment forms part of Studio Gang's Memphis Riverfront Concept. The masterplan will overhaul six miles of the city's Mississippi riverfront into bustling public spaces, with other areas including Fourth Bluff, Mud Island, MLK Park and Greenbelt Park. Memphis is among a number of US cities aiming to transform their waterfronts. New York City opened two new sites last year – Hunter's Point and Domino Park – while the Chicago Riverwalk completed in 2016, and has become a hive of activity. Boston also has plans underway for a waterside development, designed with the wider ambition to offer protection from flooding in light of climate change.